Comfortable apartment set in the heart of Trastevere walking distance from Santa Maria in Trastevere ( 30m), near transports that will allow you to reach the other parts of the city, near shops and restaurants. Living room, coffee table, table, and chairs, two double sofa beds, double bed, fireplace and three big windows with wooden antique frames and shutter, hardwoord floor, cupbaords. - entrance (before entering the actual door): it is actually a balcony, separated from the rest of the building by a little iron gate with a key. it is to be considered as part of the property and used by the tenant. Full of plants and exposed to sunlight even though it' s facing the internal side of the building. -bathroom: with bath tub and bidet, just re made completely, quite roomy. -main room: it is a large room with a table, chairs, a full bed and a queen size sofa bed. This room has a functioning fireplace and three big windows with wooden antique frames and shutters. The floor is hardwood, the ceiling is antique wooden structure. In the corridor there is a huge closet. 4 doors, very deep. This accomodation is ideal for couples, families and friend groups up to 4 members. what a great apartment in Rome. centrally located, but not right in the middle of the historic downtown area, which can get a bit touristy for our taste. everything is 100% walkable from this apartment. we never got in a cab or took any public transportation and were able to see all of the major landmarks, including the vatican. the apartment itself is gorgeous and quite large for a couple. would definitely stay here again! As the first residents in this lovely apartment, I'd to encourage other travellers to stay here. The apartment is smack in the heart of Trastevere (you see Piazza di Santa Maria from the window - gets lively in the evenings), in an area easily accessible by public transportation and within reasonable walking distance to many of Rome's main attractions and also to less touristy areas (20min walk to Piazza Navona, and if you don’t mind a longer walk - 40 min to the Colosseum, but you can get there via the bus too). Nearby are many good restaurants (touristy and non-touristy), shopping strips (where average Romans shop too) and an outdoor market and two supermarkets (at the Piazza di San Cosimato, a 5 minute walk). A few minute walk to the beautiful river. The apartment is fully equipped with everything you need (except for a sharp knife..) and with windows and shutters that block the outdoor sound and light (if the noise and light from the Piazza bothers you). The bed is queen size, and very comfortable. There is also a fire place, but we didn't try it. The kitchen is small but fully functional. - Don't confuse Via di ARCO di San Calisto with Via di San Calisto. The two are nearby and it's easy to confuse the two. 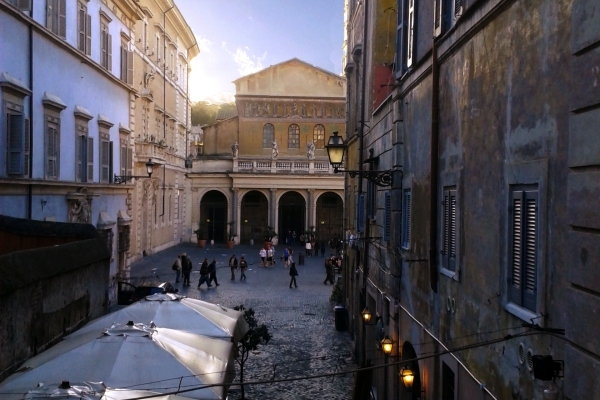 - From the airport, take the train to Trastevere, and then get the #8 tram to Sonnino, which is one stop before the river. Then walk west on via della Lungaretta (the train is going north, so west would be to your left) till you hit San Calisto. Then turn left. Overall this is a perfect spot for a couple, at a reasonable price. Cheaper and far nicer than a hotel. We both were happy and recommend it to others.